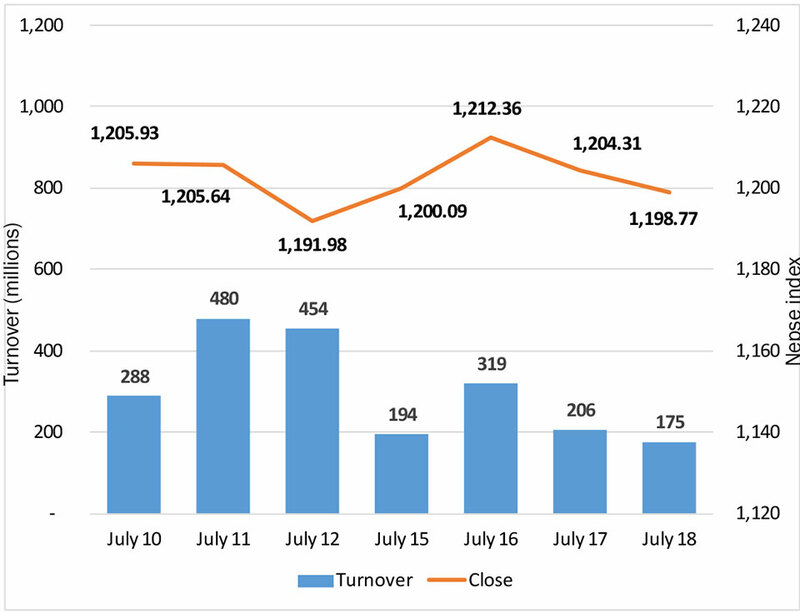 KATHMANDU, July 19: The sole equity market of the country witnessed another slow trading session on the second day of the Fiscal Year 2018/19. The benchmark Nepal Stock Exchange (Nepse) index came under pressure since the beginning of Wednesday's trading and remained modestly southbound throughout. The index posted a decline of 5.54 points to close at 1,198.77 points. 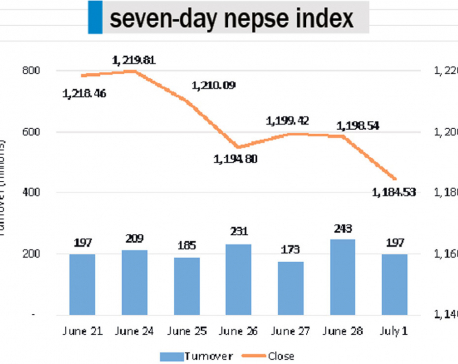 The dreary trading period observed on Wednesday is also partly attributable to technical problem seen in Nepse's website which kept investors from trading actively on the day. 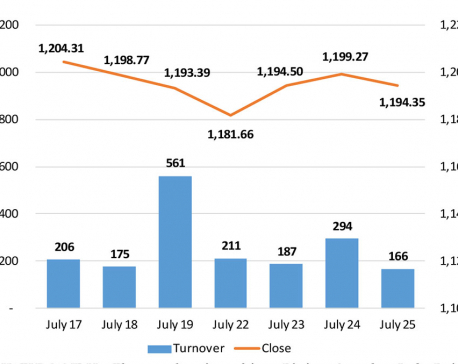 Besides, Nepse has already been turning in a series of low turnover sessions for the past few months. Consequently, the bourse posted a below par turnover of Rs 175 million on the day. Major sectors performed in tandem with the broader equity market with most of the sub-indices ending the day in red. Only Finance Sub-index ended the day higher by 0.12 percent. Trading group posted biggest decline as its sub-index went down by 1.4 percent. The Insurance Sub-index also logged loss of 1 percent. Further, sub-indices of Hydropower and Microfinance segment shed 0.99 percent each. In terms of market activity, Nabil Bank Ltd led the table of gaining companies for the second straight day as over Rs 25 million worth of its shares changed hands on Wednesday. Next on the list was National Life Insurance Company Ltd which logged total transaction of Rs 13 million. The life insurer's 60 percent rights issue is currently ongoing. Shares of Citizens Bank Int'l Ltd were also active on the day after Securities Board of Nepal (Sebon) approved its Further Public Offering (FPO) of 463,826 units of shares on Tuesday. Additionally, shares of Nepal Investment Bank and Prabhu Bank Ltd Promoter Share were also traded actively on the day. National Hydropower Company Ltd posted the biggest gain of the day as its share price went up by 4.71 percent. Nepal Credit and Commerce Bank Ltd also saw its share price go up by 2.89 percent. Shares of Vijaya Laghubitta Bittiya Sanstha Ltd, Jalabidyut Lagani Tatha Bikas Co Ltd and Central Finance Company Ltd also logged gain on the day. In contrast, Naya Nepal Laghubitta Bikas Bank Ltd logged in the worst performance of the day as its share price plunged 6.67 percent. Besides, share prices of Rairang Hydropower Development Company Ltd and Lumbini General Insurance Ltd slid over 4 percent each. Among others, Global IME Laghubitta Bittiya Sanstha Ltd, Laxmi Laghubitta Bittiya Sanstha Ltd and Nepal Hydro Developers Ltd also saw their share prices drop on the day. On the earnings front, First Microfinance Laghubitta Bittiya Sanstha Ltd (FMDBL) has reported a 27 percent rise in profit year-on-year. As per the microfinance's report for the third quarter of FY2017/18, its net profit stands at Rs 102 million. As per the technical analysis by ARKS, the market has continued to trend in a narrow channel near the 1,200-point line. Furthermore, a run of low turnover sessions in recent months indicates the stock market lacking significant conviction. At this stage, investors are suggested to maintain a watchful stance to track any major index movement which can present lucrative trading opportunity in the short run.